What does that all mean? Well it means sticking a sharp object into your brain and cutting or stabbing the frontal lobes. The frontal lobes of a brain control your personality, emotions, emotional memory, and even cognitive functions like recognizing right from wrong, or Better from best. So why was this practice done? The short answer is that it did solve your mental health problem, by making you near brain dead. There was a time when doctors didn’t care about the quality of life of the patient, but rather the quality of life of the ones that had to care of the patient. The mentality ill were seen as a burden, and it was a doctor or asylums job to relive people of that burden. Without a personality, there was no longer any screaming, kicking. Patients just became zombies that only needed to be feed and changed. While there were many less severe cases, leaving a patient functioning.Some even able to go back to normal lives. There was always emotional stunting. Many gained personality akin to children coining the phrase “surgically induced childhood.” Five to fifteen percent of patients died from the procedure and many others commuted suicide. 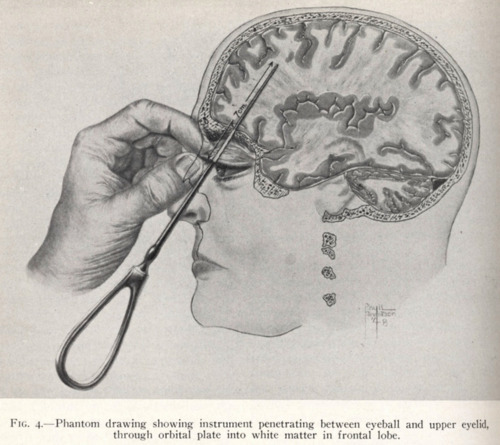 If there is anything left to save of your faith in humanity is that Lobotomy’s were controversial from the start. It is because of this controversy that it was so well studied and banned over the two decades it was popular.